In 1912, Ciriaco Verdelli and his family left Italy to go to America in search of new opportunities. Settling near Hershey, Pennsylvania the family worked at quarries and on vegetable farms for the next 12 years. 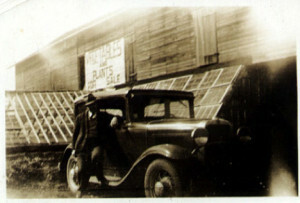 R.J. Walton, the owner of the farm in Hummelstown, Pennsylvania where the Verdelli family had worked for several years, had tired of the constant struggle with the elements. He was leaving the land and shutting down his farm operation. This decision provided the opportunity for the Verdellis to lease 60 acres of land, and with just one horse, they began growing their own vegetables. Within a few short years, Ciriaco and his family had weathered the great depression, the start of WWII, and purchased the farm in 1943. With the support of his seven children, Ciriaco continued to farm the land they loved, while mastering the intricacies of farming, American-style – from planting and cultivating, to pricing and marketing. Soon they had a team of horses and a Model-I truck that enabled them to take their produce to market. The family lived in the stone farmhouse that overlooked the fertile land. Hothouses for growing seedlings occupied the portion of the property that today is the corner of Cameron Avenue and East Second Street. 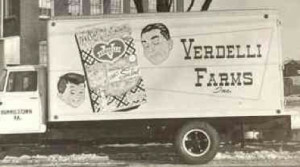 Ciriaco had charged three of his children, Bruno, Caesar, and Albert with moving Verdelli Farms one step further – pioneering the packaging of fresh vegetables for sale in the “new” grocery stores that were called “supermarkets.” By 1952, Verdelli Farms grew into a corporation. The need for refrigerated coolers and packing lines led to the construction of new buildings in place of the old barn. As the business grew, additional coolers and loading docks were added. Verdelli Farms had become an economic engine for Hummelstown, employing hundreds of local residents and relying on local businesses for supplies. By 1978, a third generation of the Verdelli family began to oversee the daily operations and plant management. With their deep commitment to their family, the industry, and their relationships with produce growers nationwide, they grew the product line to include more than 120 retail and 50 food service items, processing over 80 million pounds of vegetables per year. The growth of the business exceeded the capacity of the original buildings and land. In 1993, production ended in Hummelstown and moved to a new facility located in Harrisburg, Pennsylvania. From 1993 until 2013, the original buildings and farmhouse were vacant and rapidly deteriorating. The developers of Verde saw an opportunity to revitalize this once bustling area of Hummelstown. Land that was once used for farming and packaging vegetables is now home to upscale apartments for rent in Hummelstown, PA. Lou Verdelli Jr., the son of Dr. Louis Verdelli and grandson of Bruno Verdelli is one of the partners in the project. 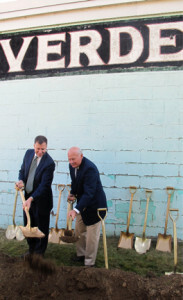 To remind residents of the history of this land and the four generations of the Verdelli family that lived and worked here, the complex was named VERDE. To further tie into the history of the business, the different floor plans are named after varieties of spinach, which was the leading product of Verdelli Farms.